�Baby Logan would have been one year old Aug. 28. 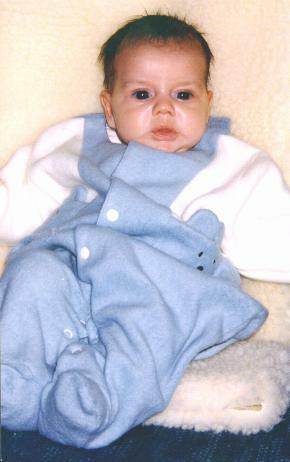 Brown-eyed Logan Braun died Nov. 27, 1998, in the arms of his mother, Sheryl, when he was only three months old. � But even in death Baby Logan is helping to find a cure for Junctional Epidermolysis Bullosa, the disease that took his life. A part of him lives. In petri dishes in a laboratory at Stanford University in California, cells from Logan's skin are growing in hopes of finding a cure for this rare disease that strikes one baby in 50,000. � "The doctors told me Logan had been a tremendous help in their efforts to find a cure. It was their hope and ours, to have Logan live until he made it to Stanford. Then doctors could have taken Logan's altered skin growth in the petri dish which behaves normally and attach it to Logan's body areas denuded of skin. In theory, the trick would be that the altered cells would teach Logan's mutated cells to change and produce the protein he was missing," Sheryl explained. � "We were so close, yet so far away," she added. � A short life worth living. � The past year has been like a roller coaster ride for this family of six. Pictures of Logan fill walls in their home in rural Greenwald. Angels, from family and friends, fill a curio cabinet in Sheryl and Jim Braun's bedroom. Whenever Sheryl opens a dresser drawer she can still smell that "baby smell" from the son she never got to really know. "Not a day goes by that I don�t think of him," said Sheryl, who knows too well how EB has affected their lives. � EB is an inherited disorder in which the skin and mucous membranes are so fragile that the slightest touch may cause painful blistering. �Junctional epidermolysis bullosa, (also called Herlitz disease) is the rarest and most life-threatening form. �In April, Sheryl and her husband, Jim, and their four other children, Colton, Jeron, Sam, and Kendra, went to Stanford University in Palo Alto, Calif., for genetic work-ups, hopeful doctors could explain the reason their fifth child was born with this life-threatening disease. They also wanted to know what the chances were that their sixth child, due in February, would be born with this same disease. Logan�s dermatologist, Dr. Julie Winfield, is on staff at this university, which is leading the way in research of this rare disease. � Although it was unusual, Dr. Scott Herron, an expert on EB, offered to give them a tour of the lab where they are trying to find a cure for EB. �Petri dishes with Logan I, Logan II, Logan III sat on a counter as they entered the lab. � When Logan was circumcised at five weeks at the University of Minnesota, his foreskin was sent to Stanford to be analyzed and grown. After it was immortalized, which means it can live forever if properly stored, they manipulated the cells to behave properly and produce the laminin 5 protein which was missing at Logan�s birth. So far, it has been a success. � You cannot imagine what it felt like to walk into the lab and see a tiny portion of Logan under a microscope and growing in a petri dish. It was so amazing. I thought "Logan in some small way is helping a future generation, maybe Kendra's and Sam's, to find a cure," said Sheryl. � Dr. Herron told the lab tech, "This is Baby Logan�s mom," "and the tech person started to tear up," said Sheryl. �Doctors explained that if they can keep Logan's skin cells growing for four to six months it will be used to approach the FDA for funding and approval to experiment and try it on human clinical trials. � "This experience has forever changed us and it has given us new meaning in life. I thank God every time I hug my children, that they are healthy and in a loving family," said Sheryl. My heart and soul aches every time I see a child suffer, either physically or emotionally. � Jim and Sheryl didn't know what to expect when they went to Stanford in April. What they found out was that they were a one in a million couple. � Dr. Herron said the chances of Jim and I meeting and having a child with this disease is one in a million,� said Sheryl, who went on to explain, "Jim and I carry a mutation in the laminin 5 protein of our genetic makeup. The unusual part is that we carry a different mutation and Logan, with the role of dice, got both." � "Logan�s type of EB involved the protein that lines the internal organs of his body. It just simply was not there and without it, he could not survive. Everyone is made up of proteins, and if one is not working properly, it destroys the whole system," said Sheryl. � � Once the medical team figured out what Logan had it was easy for them to map out with samples of the DNA, the genetics of the Braun�s nuclear family. Sheryl and Jim learned two of their children do not carry the mutation; one carries the paternal mutation and one carries the maternal mutation. � But poor Logan got the bad roll and received both mutations. Now that we know these mutations exist, they can easily be identified in a prenatal diagnosis, said Sheryl. In September she will have an amniocentesis which will detect if their baby has EB. If tests indicate the baby does have EB, Sheryl will have the baby at Stanford. � Dr. Herron was very honest. He always said, "God forbid your next baby would have EB," but the chance is there that this baby could have EB. But he also said we have four healthy children, so the risk of having a healthy child is greater than the risk of having a child with EB, said Sheryl. ��� � I keep thinking God can't do this to me twice, she added. Sheryl admits with this pregnancy she has worried more than with their other five children. � "I was just blissfully unaware of those things with the other kids," she said. "Maybe it�s because I�ve been reading so much about what can go wrong and now with all the genetic mishaps and defects it makes me more aware of what can go wrong. But I�m starting to feel more positive." � "I�m not caught up with having a boy or girl, I just want a baby with good skin," said Sheryl. "This is something that happens at conception, there is nothing I can do now to change it." � EB is a horrific disease, but I feel more hopeful this time than I did with Logan, she said. Then I felt so helpless. It seemed like every door I knocked on there was nothing, where now I know so much more and I have doctors I can contact. � When she informed Dr. Winfield that she was pregnant, she told Sheryl to get rid of items, like burn bandages, which were to be used for Logan. �"Dr. Winfield told me I didn't need them, but in the back of my mind I kept thinking that I couldn�t get bandages for Logan when I needed them. And what if I have another EB baby and need the bandages," she said. Although it was a hard decision she took them to Camp Knutson in Brainerd where children with skin disease can forget about being patients and just be kids. The week long skin-disorder camp operates under the aegis of the Camp Discovery Program of the American Academy of Dermatology. � "It was harder than I thought to give the bandages up. I carried the bandages in and started crying," said Sheryl. Giving them away was like having to say good-bye to part of what was Logan. � Seeing children who looked like Logan did was also hard. �I had never really seen another child with EB and to talk with them I thought, "this could have been Logan in so many years," she said. It also hit her that Logan never would have had a normal childhood. It would have been filled with pain. � "But these kids are bright, funny and happy," said Sheryl. They just have a different life-style then my normal, everyday kids have. "When you're given a child, you deal with whatever that child has coming with him." � Although life has returned to normal for the Brauns, not a day goes by when Sheryl doesn�t think of Logan. It might be when she�s helping Colton mix chocolate chip cookies on the same kitchen table where it took Sheryl, two nurses and an aide four hours to re-bandage Logan. It might be when she looks at a picture of a baby with his fingers curled up under his chin, just like Logan used to do before his fingers had to be wrapped. �It might be when she tries to sleep at night. � "I still don�t sleep at night," said this mother who admits she didn't get a good night's sleep when Logan was living. � The Brauns are looking forward to the birth of their baby in February. People sometimes question her as to why they chose to have another child. "I don�t want to replace Logan. But I miss the smell of a baby, the rocking him and singing to him," said Sheryl. I got cheated. When you lose a child in infancy through miscarriage, stillborn or at just a few months, you�re cheated of what you for nine months prepared yourself for. � "I got the sense that Logan was letting us go so we could experience a new life again," she said. "So I think he was the hero." � Sure another child will add to an already house full of activity, but raising a large family is important to Sheryl and Jim. � "I don�t mind raising my kids. I have fun with them. They�re rowdy and rambunctious." People say, "Boy are your kids real livewires, but that's part of their personalities," said Sheryl. � "I picture our life 20 years from now at Christmas time and we have lots of kids coming home with spouses, boyfriends and girlfriends," she said. � Right now they are preparing for the new addition to their family. � Kendra has volunteered to help when the baby comes, she said. The kids are excited and positive. � Our son, Sam, who is five, is so convinced this baby will be fine, said Sheryl. Months ago he said "Mom, you�re going to have a baby and you�re going to name him Tommy and he�s going to have good skin." � "My husband and I decided three months ago to have this baby," said Sheryl. Jim said "We have God in our lives. If it�s meant to be, it�s meant to be." So full of hopes and dreams were we. As we humbled ourselves and accepted help lovingly. But no cure could be found to heal your tiny, fragile body. How could it be that a skin disease could steal you away from me? To bade you to stay just caused too much pain. The smell of your hair, your eyes, God those big brown eyes pleading for help, some relief from pain. But you left your mark, my son, on our hearts. As we look to God for strength. As plan there must be, although untold. I guess only God really knows. Free from pain and free from life. Fly high my little one. Happy first birthday Logan, in heaven. Sheryl Braun has given birth to a new baby boy LEO ( EB FREE!! ) February 2000....Congratulations!